And its main implement to achieve this goal has been the Islamic Revolutionary Guards Corps (IRGC), which was founded shortly after the 1979 revolution. 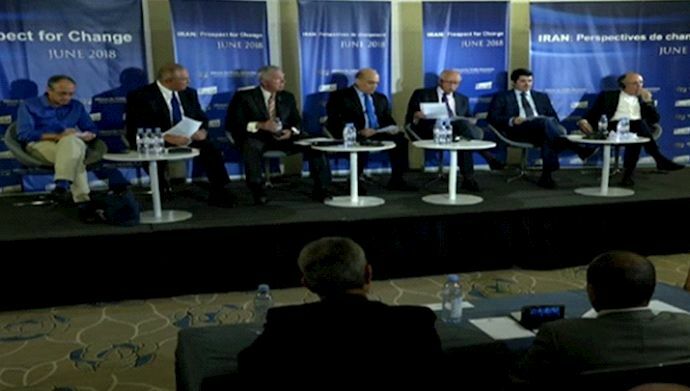 Yassine iterated a list of aggressions by the Iranian regime in his country, including its export of arms and ammunition to the Houthis and the presence of its IRGC forces in the country and reminded the panel that the UN found the Iranian regime in violation of an arms embargo. Wald then listed various facts of the Iranian regime’s violent intervention in the region in the past years, especially in Iraq and Syria. 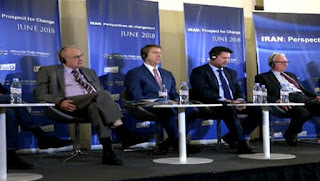 Wald also stressed that the Iranian people have proven that they do not support the regime’s meddling in the region, which became evident in recent protests. “Protesters’ grievances continued to include the regime’s support for Hezbollah and intervention in other countries,” he said. “We’ve used the term meddling for years regarding the IRGC. Today I see their activities as interdiction, subversion, and takeover of Middle East governments,” said General James Conway (Ret. ), former Commandant of the U.S. Marine Corps. Conway also gave details of the Iranian regime’s meddling in Middle Eastern countries, including the thousands of troops it has dispatched to these countries and the billions of dollars it spends on maintaining its influence in those countries. “It is hard to find a conflict or a suffering people in the Middle East that the IRGC criminals do not touch,” Conway said. Conway also noted that the IRGC is finding it increasingly difficult to find support for its foreign ventures inside Iran, where the population is tired of the expenditures and casualties in foreign wars. 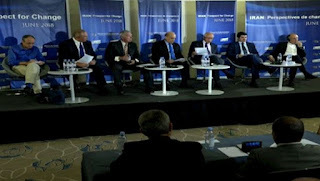 Encel made distinct recommendations for confronting the threats of the Iranian regime and the IRGC. First is a legal confrontation. “We have to raise legal issues, especially about IRGC,” Encel said. Finally, Encel emphasized the need for military confrontation with the regime, not in Iran, but with its troops and proxy groups in the region. 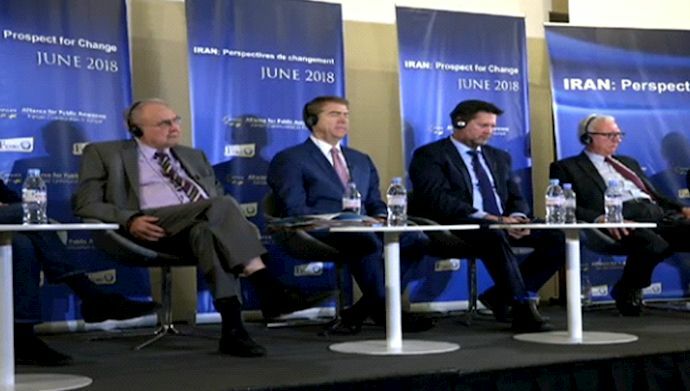 June 29, 2018 - A panel of experts in Paris discussed the IRGC and the effect of sanctions on its nefarious activities on the eve of the Free Iran Gathering. The panel was moderated by Lincoln Bloomfield, Ambassador, Distinguished Fellow and Chairman Emeritus at the Stimson Center, former Assistant Secretary of State for Military Affairs. Tertrais also said that while IRGC controls 20-30 percent of Iran’s economy and will be hard hit by sanctions, sanctions alone are not enough and not the only tool that exists. Bruno Tertrais, Deputy Director of the Fondation pour la Recherche Stratégique (FRS). Michael Pregent, Middle East analyst, Hudson Institute, said that this new round of sanctions against the Iranian regime and IRGC is different because “the IRGC and Quds force don’t have an advocate as they had in 2009,” a reference he made to the Obama administration. Pregent reminded that the Obama administration released Quds Force operatives in Iraq as concessions made to the Iranian regime during the nuclear negotiations, and those operatives engaged in very destabilizing activities. During Obama’s tenure, sanctions brought the regime to the negotiation table, but then the international community gave everything back to the regime, Pregent said. “The Iran deal collapsed because it was a giveaway to the non-nuclear threat of IRGC,” Pregent said, also noting that “Walking away from the JCPOA actually gave us leverage,” especially on other fronts, including in dealing with the North Korean regime. Pregent also highlighted the role of recent protests in Iran as a great difference between the last round of sanctions and the current round imposed under the Trump administration. “I wish more western media would cover the protests. These protests are very important,” Pregent said. Robert Joseph, Ambassador, U.S. Special Envoy for Nuclear Nonproliferation and Under Secretary of State for Arms Control and International Security until 2007, who spoke next, started by highlighting the importance of the Free Iran Gathering, which will be held tomorrow. “It’s a great even and I’m happy to be part of it,” he said. On the issue of sanctions, Joseph said that, “Sanctions can work if they’re part of a broader strategy.” That broader strategy, Joseph underlined, must include support for the people. Joseph also debunked claims that sanctions against the Iranian regime will put the Iranian people at odds with the international community. “The Iranian people understand what the cause is and appropriately put the blame on the regime,” he said, explaining that the people are fully aware that the regime is corrupt to the core and squanders their money on terrorism across the region. Joseph recommended that the world must continue to attack the financial networks of the IRGC beyond finance and petroleum, including to mining, engineering and construction. “The IRGC is pervasive in the Iranian economy,” he said. Robert Joseph, Ambassador, U.S. Special Envoy for Nuclear Nonproliferation and Under Secretary of State for Arms Control and International Security until 2007. Secretary of State Mike Pompeo on Wednesday June 27, 2018 commented on demonstrations in Iran, saying protesters are fed up with the country's leadership. "The people of Iran are tired of the corruption, injustice, and incompetence from their leaders," Pompeo said in a statement. "We condemn the government’s same futile tactics of suppression, imprisonment of protestors, and the denial of Iranians’ frustrations." Sadegh Larijani, the chief henchman of the clerical regime's judiciary, on Tuesday, June 26, on the third day of the strike of the Bazaar and popular protests and in fear of spreading these protests, threatened the perpetrators of the "riots" of Tehran and "disrupters in the economic system" to decisive action and execution and said: "These acts have severe penalties as a disruption to the economic system of the country under the law of disturbing the country's economic system. It has been seen that, if this is a case of corruption, the execution would be carried out and, if not, it would be 20 years' imprisonment." 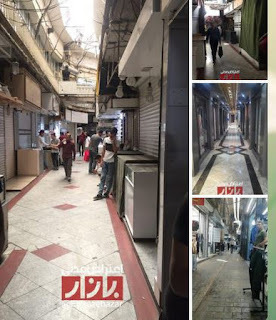 The strike of Tehran Bazaar continued for the fourth day on Wednesday, June 27th. 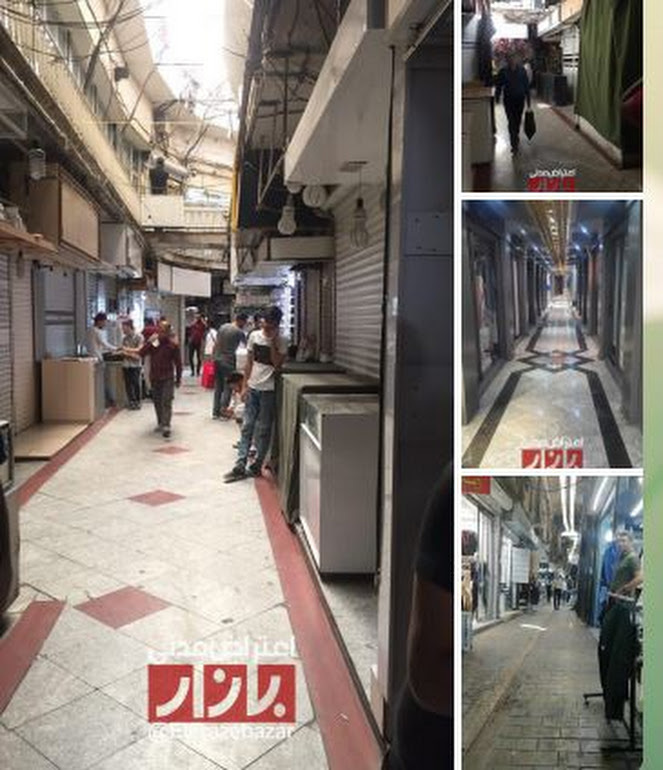 In the Soltani bazaar, people demonstrated chanting: Zealous merchants, support, support; Do not be afraid, do not be afraid, we are all together. 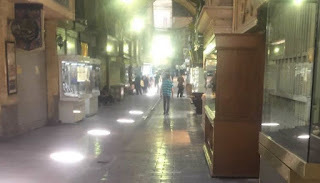 The merchants in the Grand Bazaar of Tehran, the Goldsmiths’ bazaar, Chaharsoogh, Mellat Avenue, Mowlavi, Laleh Zar, and the Aladdin Mall also refused to open their shops. In Hassan Abad, people and bazaar merchants protested and chanted: We do not want inflation and high prices. On Wednesday, June 27, 2018, a group of railway workers from the Railway Engineering and Construction Company of Azerbaijan (Eastern Azerbaijan Province in Iran) gathered once again in protest to the expulsion of 50 of their colleagues and held a protest rally in front of the Tabriz railway station. The railway engineering and construction company (Ballast) is a contractor of infrastructure and maintenance projects for railways and plans to expel another 150 workers in the near future. The Iranian economy took another nosedive this weekend, with Iran’s currency, the rial, dramatically decreasing in value against the US dollar, the Euro, and the British pound. 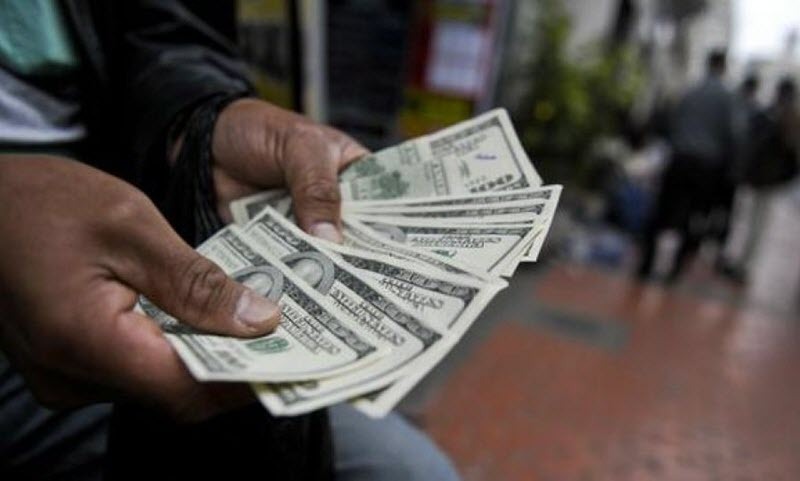 By Sunday night, the unofficial exchange rate had reached 90,000 rials per dollar, which is more than double the artificial rate of 42,000 set by the Central Bank of Iran back in April. Regime officials believe they can stabilize the market by freezing the exchange rate and limiting the reasons for needing to buy hard currencies (like those listed above), but with only 40 days to go until US sanctions are re-imposed and lax policies by the administration of President Hassan Rouhani, it seems like the chaos is here to stay. 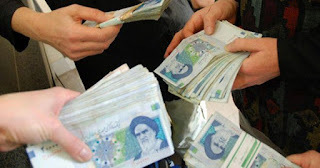 The Iranian Regime attempted to counteract the fall in the rial by artificially setting an exchange rate, banning any currency trade outside the banking system, shutting down currency exchange offices, and punishing anyone who held more than 10,000 Euros. This has failed because no one has used the official rate when pricing – as it would bankrupt sellers – so they are using the market rate, even increasing their prices hourly. One of the major problems is the huge gap between Iran’s exchange rate and the global one. Many Iranian oil and petrochemical companies are paid in hard currencies for exports, but they are unwilling to exchange these at the Iranian official rate as essentially it would cut their profits in half. Iran’s policy actually reduced economic activities while creating numerous opportunities for corruption for the officials in charge. 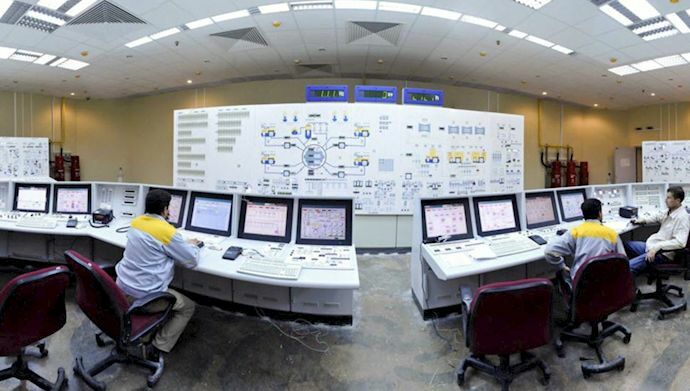 Pedram Soltani, the vice president of the Iranian regime’s Chamber of Commerce, Industries, Mining and Agriculture, noted a huge increase in import permit requests. But Rouhani’s administration is not tackling that corruption and is effectively an accomplice in the Regime’s looting on the economy. Many Iranian businesses and consumers have given up on expecting any reality-based policy-making. They are preparing themselves for increased inflation and rising prices, while the Regime is still refusing to admit that anything is wrong. Of course, the reality is that the Iranian Regime will never admit to having made the wrong decisions when it comes to the economy and they are in no position to fix the problems they’ve created. The only way to make the Iranian economy work for the people is to change the regime. Regime change, which is the main topic at the Free Iran gathering in Paris on Saturday, is the wish of the Iranian people. Sadegh Larijani, the head of the judiciary, and Jafari Dolatabadi, the criminal prosecutor of Tehran, threatened the perpetrators of the "riots" of Tehran and "the disrupters in the economic system" with decisive attitude and execution. On Tuesday and Wednesday, hundreds of relatives of detainees gathered in front of Evin Prison to demand the release of their children and relatives. The regime's officials consistently deny the presence of these people in prisons and refuse to answer. بنا بر گزارشات گردآوری شده از شرکت مدیریت شبکه برق ایران، وزارت نیروی رژیم، و گزارشات خبرگزاریهای حکومتی «فارس و مهر» به‌دلیل عدم اجرای پروژه‌های تولید برق، متناسب با میزان رشد سالانه مصرف برق در ایران و اتلاف ۱۰٪ از تولید برق در شبکه برق رسانی به‌دلیل مستهلک بودن شبکه برق رسانی ایران، رژیم ایران قادر به تأمین برق مورد نیاز نیست و کشور با جیره‌بندی و قطعی برق مواجه خواهد بود. با اوج‌گیری مصرف برق به‌دلیل فصل گرما، تهران و برخی از استانهای کشور با قطعی برق مواجه شده و ذخیره برق نیروگاهی صفر شده است. بنا بر گزارش شرکت مدیریت شبکه برق که در سایت رسمی آن منتشر شده ‌است، میزان مصرف برق در «ساعت ۱۶:۲۲ پنجم تیرماه به، ۵۴۲۷۵مگاوات رسید» و باعث شد ذخایر برق به صفر برسد. این میزان مصرف ۲۸٪ بیشتر از بازه زمانی مشابه در سال ۹۶ است. گزارشهای رسیده نیز از قطع برق در برخی استانهای کشور از جمله تهران خبر می‌داد. خبرگزاری حکومتی فارس روز ۶تیر ۹۷ گزارش داد: «روز گذشته در حالی که برخی مناطق مختلف تهران با خاموشی‌های چند ساعته برق مواجه شده بودند، مسئولان ارشد برق این اتفاق را ناشی از گرمای بیش از حد می‌دانند». خبرگزاری «فارس» به‌نقل از وزیر نیرو از کسری ۵ تا ۶هزار مگاواتی برق خبر داده و مدعی شد که این کسری را باید از طریق مدیریت مصرف و تقاضا جبران کرد. خبرگزاری حکومتی مهر نیز گزارش کرد: حسین صبوری، مدیرعامل شرکت توزیع برق رژیم در تهران، به این خبرگزاری گفته‌ است که تابستان امسال شرایط متفاوتی را تجربه می‌کنیم چرا که از ظرفیت ۱۰هزار مگاواتی نیروگاههای برق‌آبی تنها ۵۰درصد آن قادر به تولید برق است. فربد استیری، مدیر مرکز مدیریت نیروگاههای برق‌آبی رژیم ایران نیز، به خبرگزاری حکومتی مهر گفته است: افت حجم بارندگی‌ در کشور، از ابتدای مهر ۹۶ تا کنون تنها به ۱۶۷میلی‌متر رسیده‌ که در مقایسه با سال گذشته ۲۶٪ کاهش داشته‌ است. مقامات رژیم ایران بدون این‌که سیاستهای چپاولگرانه و ضدمیهنی خود را تغییر دهند بارها نسبت به کاهش ذخایر آب سدها و در نتیجه افت تولید برق هشدار داده‌اند و علت را در بحران بی‌آبی ربط داده‌اند که خود حاصل سیاستهای غلط رژیم ولایت فقیه است. اما آنچه که کارگزاران رژیم بحران‌زده ایران به آن اشاره نکرده‌اند، رشد ناکافی تولید برق حرارتی و منابع تجدیدپذیر است. کشور ایران بر حسب افزایش جمعیت و رشد مصرف برق بایستی سالانه حدود چهار هزار مگاوات به تولید برق خود بیفزاید. اما بنا بر گزارش سالانه وزارت نیروی رژیم ایران، توان عملی نیروگاهها تنها ۲.۳٪، یعنی کمتر از نصف رشد مورد نیاز افزایش یافته‌ است. خاطر نشان می‌شود قدرت عملی نیروگاههای ایران در حال حاضر حدود ۶۰هزار مگاوات است، اما به‌دلیل استهلاک شبکه برق رسانی ۱۰٪ تولید در شبکه تلف می‌شود و به دست مصرفکنندگان نمی‌رسد. 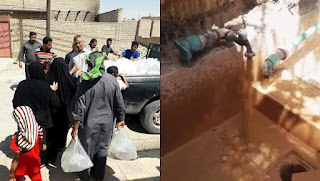 به عبارتی بیش از ۶۰۰۰مگاوات برق تولیدی کشور در شبکه برق رسانی هدر می‌رود. به‌علاوه بخشی از برق تولید شده، در تأسیسات نیروگاهها مصرف می‌شود. رژیم ایران در نظر داشت بعد از توافق برجام و لغو تحریمها در ۲۰۱۵ برای راه‌اندازی نیروگاههای تجدیدپذیر مانند نیروگاههای خورشیدی و بادی و... برای تولید ۵۰۰۰مگاوات برق، جذب سرمایه کند، اما در عمل میلیاردها دلار پول آزاد شده از توافق برجام را خرج دخالت در کشورهای منطقه، صدور تروریسم و برنامه موشکی و پیش برد پروژه اتمی کرد و هم‌اکنون (تا ۲۵خرداد ۹۷) کل توان تولید برق ایران از منابع تجدید پذیر، مطابق آخرین گزارش هفتگی وزارت نیروی رژیم، حدود ۳۶۴مگاوات رسیده است (یعنی کمتر از نیم درصد در کل تولید برق کشور). خاطر نشان می‌شود، مجموع کل تولید برق هسته‌یی و تجدیدپذیر ایران نیز کمتر از ۲٫۷درصد کل برق تولیدی کشور است. ایران عمدتاً متکی به تولید برق حرارتی است. لازم به ذکر است که بازده نیروگاههای حرارتی در ایران به‌طور میانگین کمتر از ۳۸درصد است. رژیم ایران همچنین اعلام کرده بود که در نظر دارد نیروگاههای حرارتی خود را با جذب سرمایه‌های خارجی به نیروگاههای سیکل ترکیبی تبدیل کند تا بازده آنها را به بالای ۴۵درصد برساند، اما آمارها نشان می‌دهد که بازده نیروگاههای حرارتی به‌طور متوسط تنها نیم درصد بهبود یافته‌ است. اما اکنون بعد از شکست برجام و اعمال تحریمهای تشدیدشونده ثانویه هیچ چشم‌اندازی برای سرمایه‌گذاری خارجی نیز وجود ندارد و تشدید ناتوانی رژیم آخوندی برای تأمین برق کشور و برانگیختن اعتراضات بیشتر اجتماعی در چشم‌انداز است. کیفیت آب لوله‌کشی بسیار پایین و گل‌آلود است و طعم و بوی آن به شکلی است که غیرقابل آشامیدنی است. همین امر موجب اعتراض مردم شده است. به‌خاطر کمبود آب مردم شهرهای آبادان و خرمشهر آب را از تانکرها خریداری می‌کنند. در حالیکه نارضایتی‌های مردم از حاکمیت پلید آخوندها به اوج رسیده و در شهرهای مختلف خروش مردم ایران علیه این رژیم ضدایران و ایرانی بلند است، گوشه‌هایی از بحران حاد آب و به‌ویژه شوری چند برابر آب در خوزستان با تیترهایی از قبیل: خوزستان مرد. و آب‌نمک روی زخم‌های ۳۸ساله خوزستان؛ در رسانه‌های حکومتی به چشم می‌خورد. خوزستان مُرد، تشکیل ۱۰۰هزار هکتار نمک‌زار در ۶ماه – بیماری خرمشهر و آبادان را فراگرفته است. فعالان محیط‌زیستی می‌گویند آبی که در رود کارون جریان دارد، آب- فاضلاب است! شوری آب در برخی از مناطق به میزان شوری آب دریا رسیده است اما کارگزاران رژیم این موضوع را اعلام نمی‌کنند. یک رسانه دیگر رژیم درباره میزان شوری آب خوردن مردم آبادان و خرمشهر می‌نویسد:‌ طی دو روز گذشته در بهمنشیر شاخص شوری آب ۱۸هزار و دویست یی‌سی و در کارون بیست هزار یی‌سی بوده است. این در شرایطی است که حداکثر شوری آب در شبکه توزیع باید دو هزاریی‌سی باشد. یعنی آبی که برای خوردن و شستشو به مردم داده می‌شود، ده برابر حد مجاز شور است. کمبود آب باعث گسترش بیماریهای پوستی و گوارشی در سطح شهر شده است. هم‌چنین انتقال آب از سرچشمه رودهای کارون و کرخه باعث یک فاجعه زیست محیطی در قرن اخیر شده به‌نحوی که صدهزار هکتار نمک‌زار فقط در ۶ماهه گذشته ایجاد شده که به سمت نخلستانها در حرکت است و می‌تواند مرگ چند میلیون نخل و پایان قصه‌ای به نام نخلستان در خوزستان را به‌دنبال داشته باشد. کارگزاران رژیم وعده برطرف شدن شوری آب تا نیمه تیرماه از طرح الغدیر را داده‌اند که آب شهرهای خرمشهر و آبادان را تأمین خواهد کرد. این طرح آبرسانی توسط قرارگاه خاتم سپاه پاسداران جهل و جنایت از سال ۱۳۸۷ با هدف تأمین آب شهرها و روستاهای خوزستان به اجرا در آمده و قرار بود سه ساله به اتمام برسد که از آغاز آن تا کنون ۹سال گذشته است. مردم شهرهای آبادان و خرمشهر می‌گویند:‌ شوری آب در خرمشهر و آبادان حیات و معاش را برای بسیاری از مردم دشوار کرده است به شکلی که بسیاری از مردم در این شهرها برای تهیه آب که نیاز اولیه حیات هر انسانی است باید ساعتها در صف خرید آب بایستند. مردم خرمشهر و آبادان زخم ۳۸سال جنگ، فقر، بیکاری و دهها زخم دیگر را بر روی قلب خود می‌بینند و این‌که بعد از گذشت سال‌ها باز هم بر روی این زخم های دهان باز، آب نمک پاشیده شود، چیزی جز ظلم و ظلم نیست.